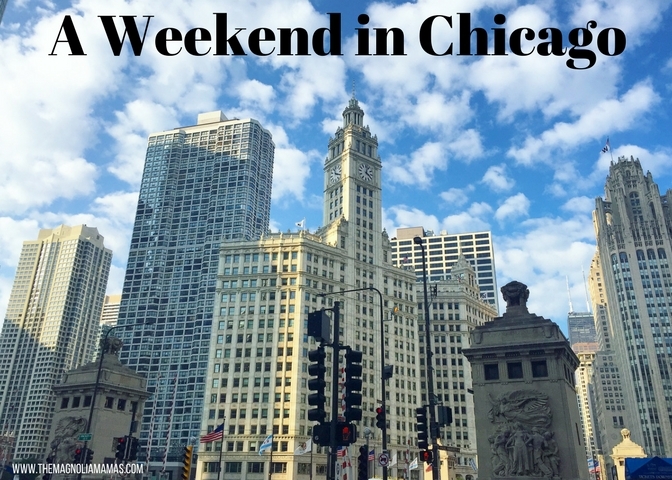 Yesterday I shared the first part of our weekend getaway to Chicago, and today I will share the second day. Be prepared for a picture overload. We packed a lot of sightseeing into a short amount of time. We logged 28 miles of walking in two days, and ate almost enough Chicago style pizza to make up for it. While the day before was the beautiful, our second day we woke up to cold and rainy temps. It didn't deter us though. We put on our raincoats, pulled on our rain boots, and armed ourselves with umbrellas purchased from the hotel gift shop. I quickly realized my raincoat and my rain boots were some of the best buying decisions I have ever made. I bought my raincoat the day before during our shopping excursion on the Magnificent Mile, and the boots Mr. Cute gave to me a few Christmas' ago. The rain switched on an off from pouring to POURING, and I was almost 100% dry. Mr. Cute's rain pants didn't even hold up. Plus walking over 15 miles that day, the boots didn't hurt my feet once. It made for touring in the rain so much more feasible. I think part of it is that these are the Packable version of the tall Hunter boots so they feel a lot lighter. We made our way to some local historic sites close to our hotel, and then just did some walking. After being in the rain for about an hour and a half we decided to make our way to the Navy Pier. We had been on our last trip, but had Cute with us and it was difficult to walk through with a toddler. It had been raining that time too, and the crowds were difficult to navigate. We had taken him to the Children's Museum on site though and remembered it was awesome! If you are touring Chicago with little ones I would definitely check it out. It's probably one of the best children's museums we've ever been to. We made it just in time as a big thunderstorm was rolling in. We figured we would check out the inside part of the pier and from what we remembered there were shops, artist stands, and restaurants to enjoy. Well... completely wrong. The pier is currently undergoing a renovation and was nothing like what we remembered. It looked like a large food hall mixed with a few stores. Considering we didn't want to eat cafeteria style and the rain didn't look like it was going to let up anytime soon to be able to check out anything outside, we decided to bail. We hated to miss it again, but know we will be back to check in out someday. We grabbed an Uber ride from the pier to dry ourselves out with a little famous Chicago deep dish pizza. My New York parents might disown me for saying this, but give me all that Chicago buttery deep dish crust any day of the week. I couldn't wait! We made our way into Lou Malnati's and thankfully there was only a short wait. They took our order before we sat down to speed up the process, but either way it was totally worth the wait. So so yummy! I could have eaten a second one and not felt one bit guilty about it. After satisfying our appetites we decided to brave the rain once again. Mr. Cute and I debated seeing a show since our hotel was in the theater district, but in the end shopping won out for Mr. Cute. We headed our way back to the Magnificent Mile, and I watched Mr. Cute his little heart out. I on the other hand knew I didn't want to carry bags of stuff all over the city. I was content watching him and then I voted for a Chicago treat. People raved about the Garrett Popcorn Shop, and I was craving a snack after all that shopping. After our first sample we totally understood the hype. They had several yummy mixes on hand and it was so hard to choose. In the end we loved the Garrett Mix and the Pecan Caramel Crisp the most. Neither one made it home. We still had a few hours to kill before our dinner reservations and the rain was still going strong so we decided to do another touristy thing and headed to the Willis Tower. We had been once before, and we knew there would be limited visibility, but we still thought it would be fun to check out. Heights make me nervous, and I can't even imagine working at the top of a building that tall. With that said it is such a neat experience, and the construction/history behind the tower is impressive. The view was so neat to see. You were literally on top of the clouds. We could see the rain and thunderstorms below us - it was incredible. And it looked so eery seeing just the tops of the buildings through the clouds. One side of the tower was a little clearer and you could still see straight down to the ground below. Mr. Cute still coerced me out onto The Ledge. Even without clear visibility below it made me super nervous. We also were able to stay on it for awhile because due to the weather the crowds were almost non-existant. It wrapped up the touristy part of our day. From there we caught a cab back to our hotel to enjoy a quick little happy hour before getting ready for dinner. We sat in the lounge area of the hotel and took in all its beauty. Then we ended up chatting with another couple who told us about a fun event Chicago was hosting that weekend. More on this tomorrow, but we were so glad to have met that couple and learn the information. It made for a fun addition to an already fun trip. After we parted ways with our new friends, we decided to lounge in our room a bit. I ate the remainder of my popcorn from Garrett's, drank some delicious wine, and lounged while watching football. Perfection. Eventually I peeled myself out of that warm, comfortable, and DRY bed to get ready for dinner. For dinner we had reservations at The Capital Grille. We have one of these in Atlanta, and have been to a few in other cities, but we know it's definitely a sure thing when it comes to good food, and after walking in the rain all day that was exactly what we were looking for. The meal was beyond delicious and I tried a new wine that I am not ashamed to say I ordered a whole case of not even a week later because I couldn't stop thinking about it. It was the perfect ending to our day, and once we were nice and full we rolled our stuffed selves back to the hotel. It took me .2 seconds from the moment I put my cozy pjs on to fall asleep. Tomorrow I will share the last little bit of our trip, and I already can't wait to make our way back to this wonderful city soon! Have you been to Chicago? What are some of your favorite sites to see, things to do, places to eat?